IN AN EMERGENCY - Please note; Burwood Hospital does not have an Emergency Department. The nearest Emergency Department is at Christchurch Hospital. When there is a medical emergency, call 111 and ask for "ambulance" . ​​​​​​​​Parking is available on site and also on Mairehau Road. Car parking areas for visitors can be reached via the new Entry 1 on Burwood Road. The best entry and parking to use for patients having day surgery is Entry 5 on Mairehau Road. ​See bus route links for more information about bus services to Burwood Hospital. A directory of Burwood Hospital departments, services and medical facilities, is listed alphabetically below. Burwood Hospital has long been recognised as one of New Zealand's centres of excellence for rehabilitation and elective orthopaedic surgery. As of June 2016, it became much more. In 2013, as a significant part of a $1 billion spend agreed by the Ministry of Health and Canterbury DHB, site clearance began for the creation of state-of-the-art facilities linked to the 'old' Burwood Hospital. Our changing lifestyles, people living longer and a growing population have prompted us to look again at the way we deliver health services. Innovative thinking and design has shaped these new facilities to deliver better, more efficient healthcare now and in years to come. The new buildings house an impressive 32,500m2 of purpose-built facilities on three floors and provide a total of 230 new inpatient beds. Included are new ward blocks for medical, rehabilitation and mental health services for older people. There are also new outpatient areas, including radiology and pharmacy areas. Each 24 bed ward has three communal patient lounge areas plus a whanau room where patients can spend time with family members. The entire new build has beautifully landscaped courtyards throughout, designed to let in as much natural light as possible and help keep people connected to the outdoors. In Older Persons Mental Health wards there is a large communal lounge, as well as quiet lounges and dining spaces. The Adult Rehabilitation ward has a small computer and library room, and there is a Reflection Room to complement the current Chapel. These areas can be freely used by patients and family members. Our Volunteer shop offers a wide range of gifts, fresh flowers, magazines, The Press newspaper, toiletries, Dry Cleaning Services, and a small range of New Zealand Post Services. Shop Hours are 10am - 3pm Monday to Friday. ​​Ground Floor- inside main entrance. There are beverage bays located within the wards. These bays have tea and coffee making facilities for visitors, staff and patients. There is also a filtered water tap at the cafe bench. Unichem pharmacy is now open and is located in the main reception area. Please note; Burwood Hospital does not have an Emergency Department. When there is a medical emergency, call 111 and ask for "ambulance" ​. For other medical care, call your usual general practice team, day or night. 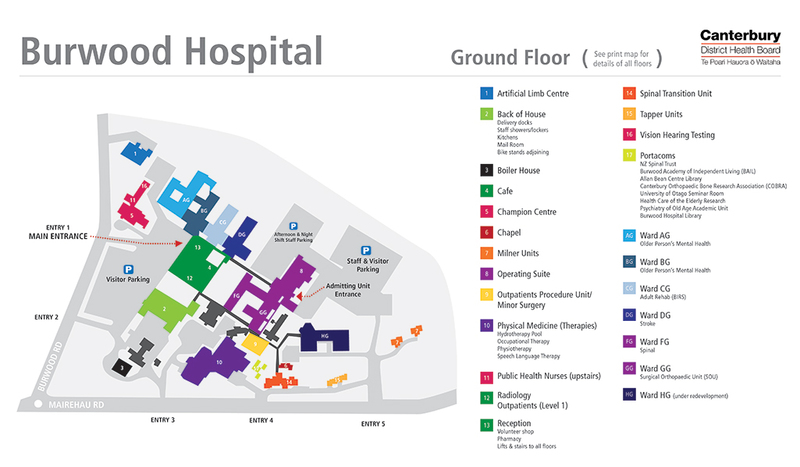 ​For more information about visiting Burwood Hospital you can view our printable ​Burwood Hospital map (PDF) which lists services in the new hospital building. A new Burwood Hospital map featuring all services on Burwood Hospital Campus will be available soon.